French priest Joseph M. Paret (1807-1872) served in the missions of Louisiana from 1847 to 1869 as pastor of the Little Red Church, located upstream from New Orleans on the east bank of the Mississippi River. During his somewhat lonely tenure, Paret sketched landscapes, architecture, and interiors, capturing everyday life in prosperous St. Charles Parish. In 1987, fifty-three watercolors were discovered -- still bound in their original sketchbook -- among his personal effects. Plantations by the River contains twenty-eight of these paintings created in or about the year 1859. Paret's insightful artwork provides a visual social history of the antebellum creole culture of south Louisiana and documents properties in addition to structures and furnishings of the period. The book features full-size reproductions of Paret's paintings, which have been restored to their original vibrancy. The value of Paret's detailed folk art lies in the accuracy of his depiction of the region he lived in. He faithfully renders parishioners attending church, men pulling driftwood from the Mississippi River, and the edifices and flora gracing local plantations Ormond and Good Hope, among many others. The text is presented in both English and French; and as a supplement to the art, an appendix of excerpts from Mon Journal d'Amerique -- a collection of correspondence between Paret and his family -- is included. 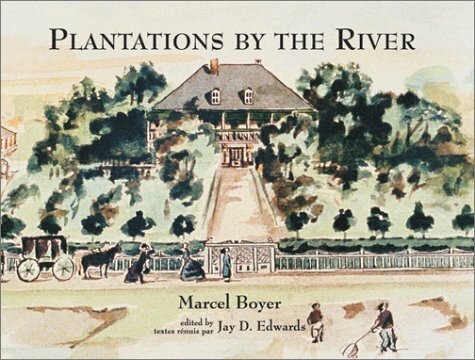 The beautiful, brightly colored paintings of Plantations by the River are a rare discovery and provide a unique view of rural Louisiana life before the onset of the Civil War. If you have any questions about this product by Brand: Louisiana State Univ Pr, contact us by completing and submitting the form below. If you are looking for a specif part number, please include it with your message.